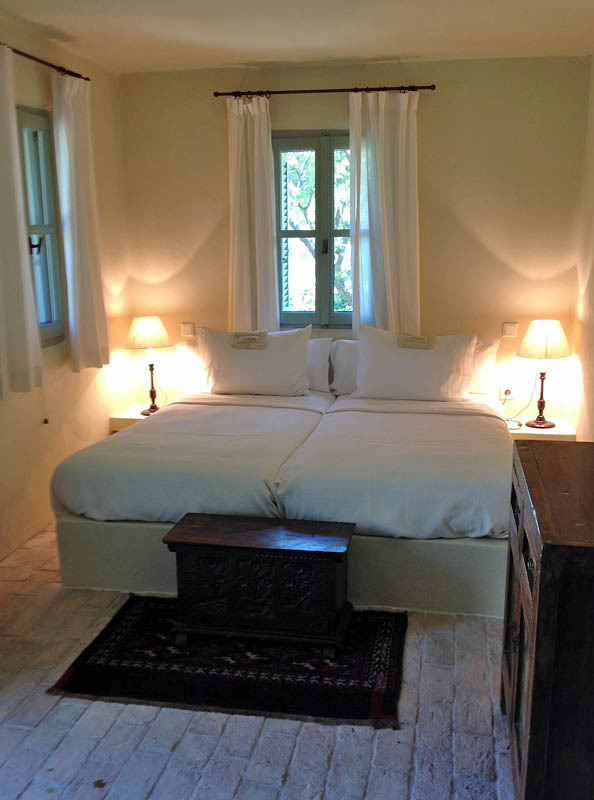 This little bed and breakfast on Andros is a hidden gem. And I mean, Ktima Lemonies is really hidden, and it really is a gem. 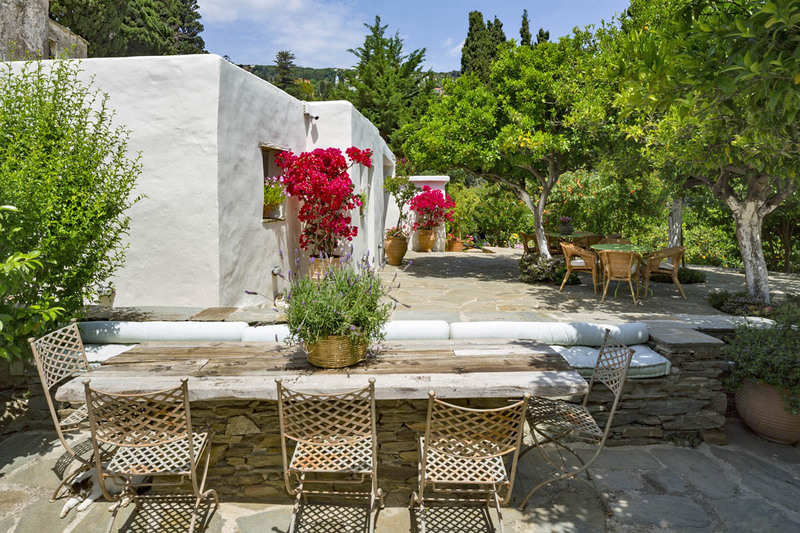 A small, old farmhouse and a few stables are set in a 3-acre property with heaps of olive and fruit trees, cypresses and vegetable gardens. 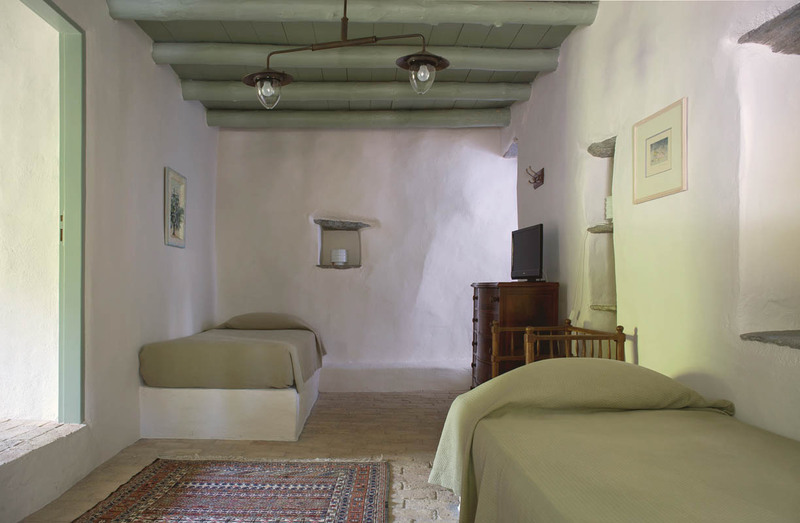 Michalis and Nelly restored them with care, and converted them into a place where they spend weekends and holidays, while having a few rooms and a suite for guests as well. 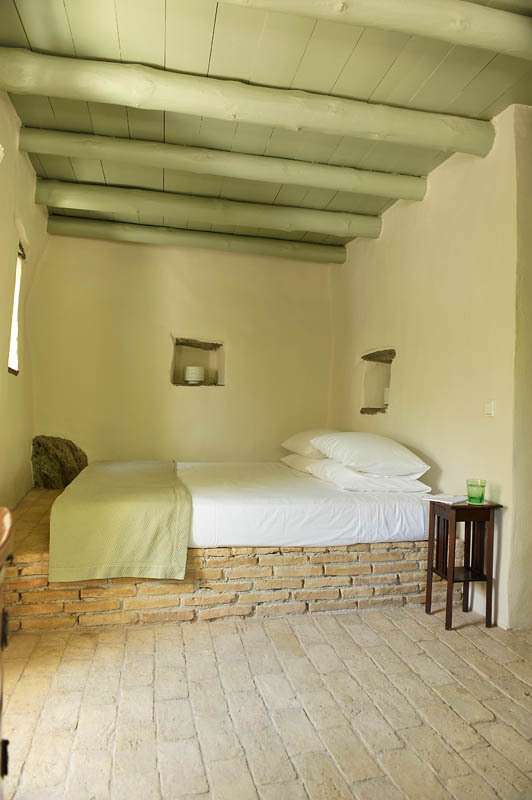 The latter, with a double bedroom and two single beds in the adjacent sitting space is perfect for families, and the other three rooms, doubles, are sweet and cosy. 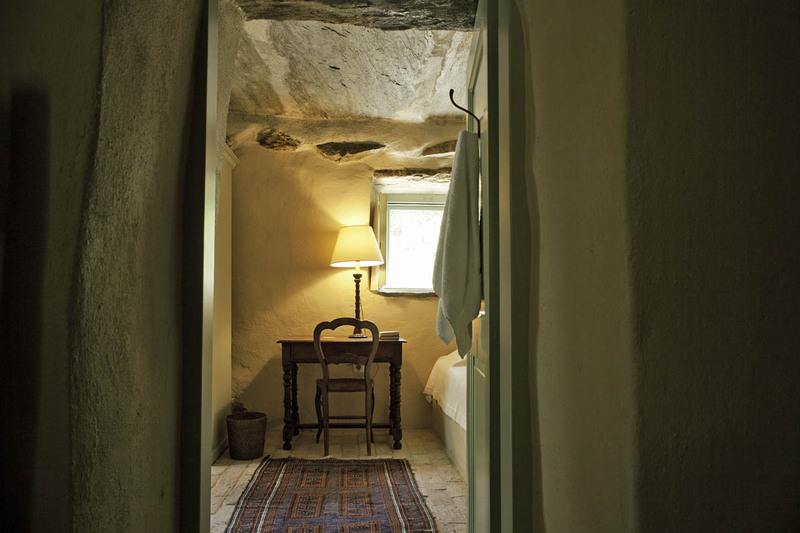 One of the rooms is in the converted old pigsty (!) and has a ceiling made out of massive stone slates. 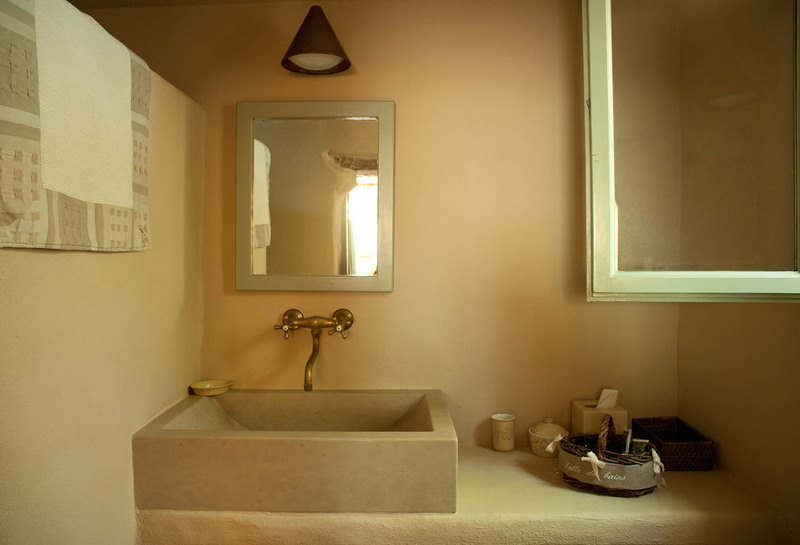 Everything at the guesthouse is done in a charming country-style: floors are made from pale brick, most furniture is antique; beds are very comfy and bathrooms with walk-in showers are pretty. The gardens are paradise on earth. 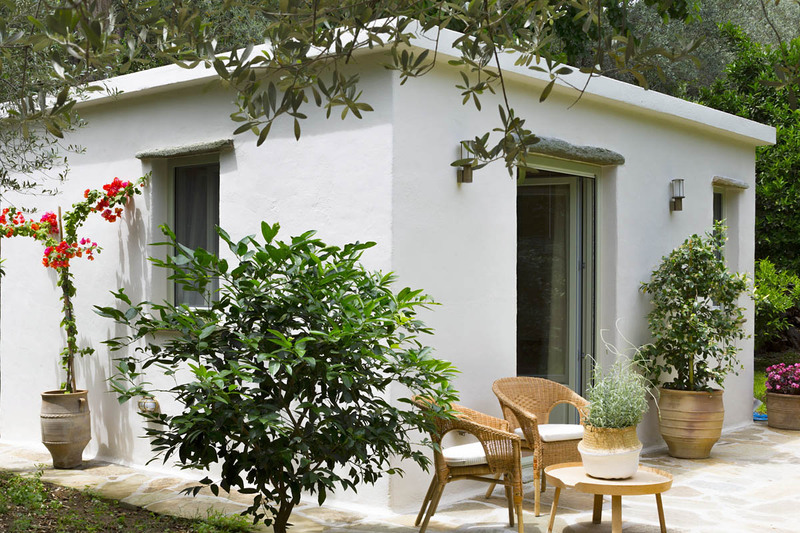 You will find sitting corners shaded by lemon and apricot trees, you can pick a sunbed by the (smallish) swimming pool to work on your tan, stroll around the terraced gardens, and admire everything that grows and blossoms. 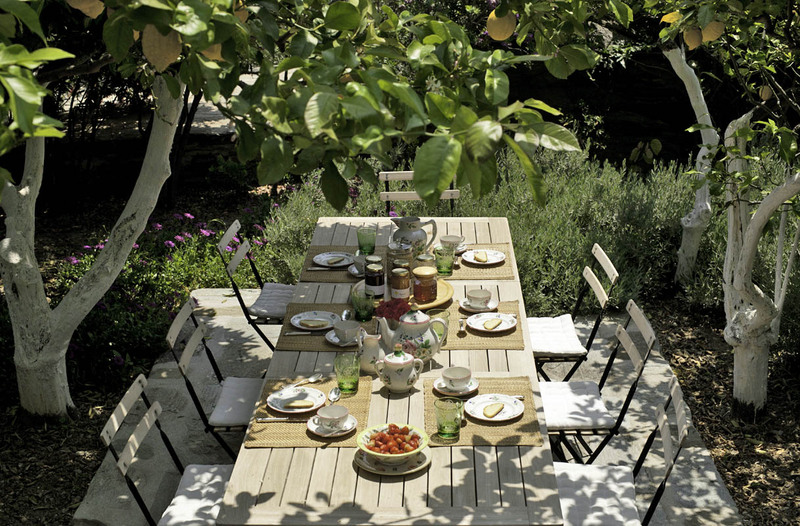 I ate a few apricots I’d just picked from the tree, played with a little kitten, listened to the singing of birds, had dinner with Michalis and Nelly under the stars, slept well in a wonderful bed, tried five different fruit jams for breakfast – every moment at Ktima Lemonies was special. 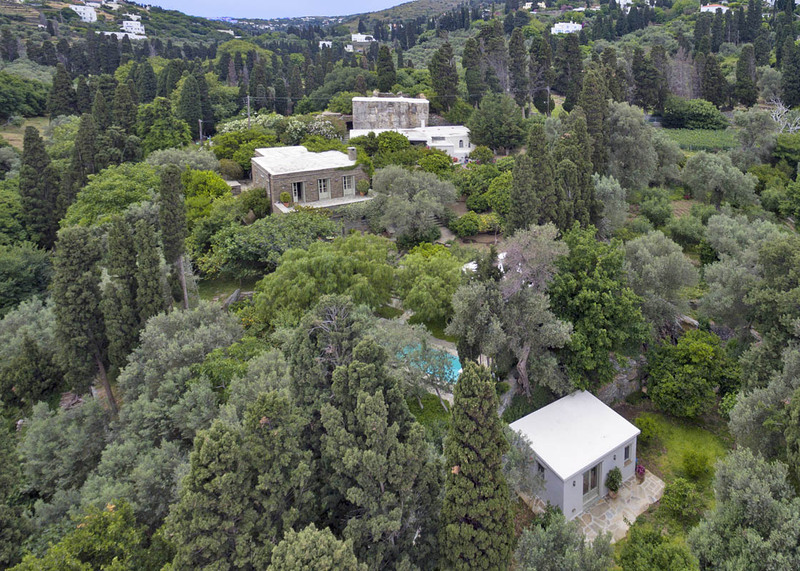 Ktima Lemonies is in a lovely location in one of the greenest parts of Andros, but it is relatively isolated, so there is no quick popping out to get lunch or an ice cream. Unless you are an unflagging walker, you need a car to go around. 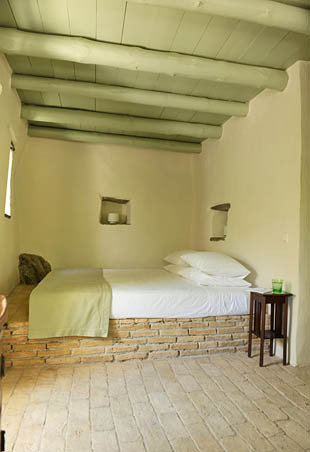 Prices for two persons from 120 Euro per night, breakfast and taxes included. For a full overview of room rates, please contact Nelly. 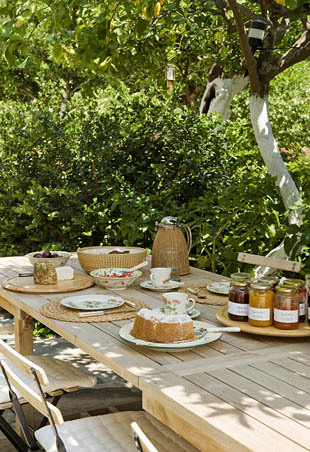 For breakfast, served between 9.00 to 11.30 am in the shade of fruit trees or in the dining room, you will get fresh bread, a selection of homemade jams, eggs, yogurt, cereals and of course plenty of fresh fruit and juice. 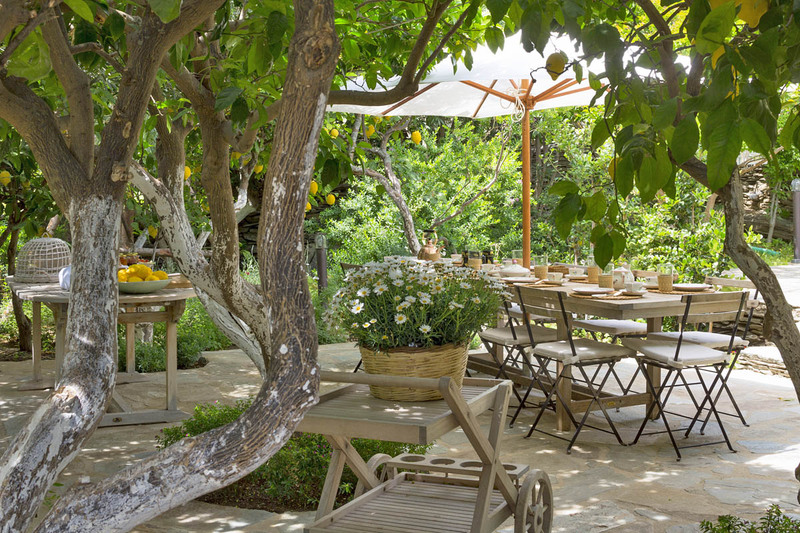 During the day you are free to pick fruits from the garden (oranges, and mandarins in the winter, strawberries and cherries in spring, peaches and apricots in the summer and pears in the autumn, to name only a few…). 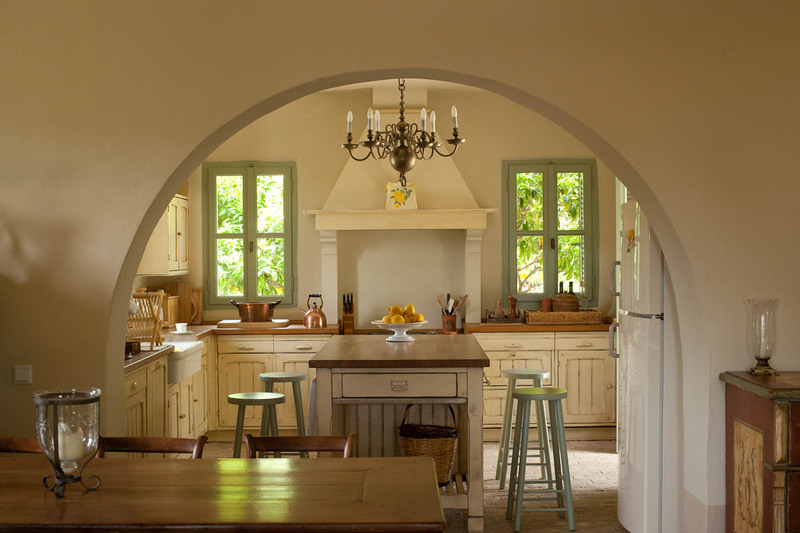 If you book the entire property, home-cooked dinners can be served on request. I very much enjoyed my meal with local oven-cooked meat (very tender) and heaps of fresh garden veggies. 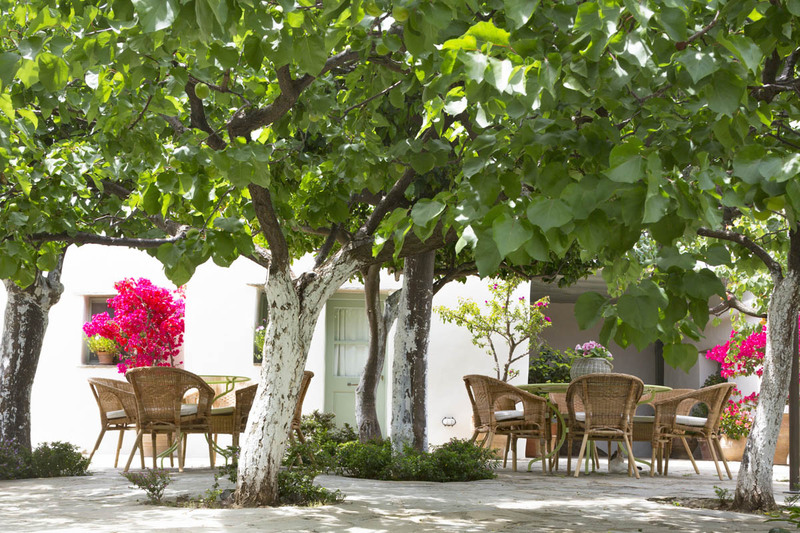 There are no places to eat in Lamyra, but the hora of Andros is only 2 km away and there of course you have a good choice of Greek restaurants and tavernas. 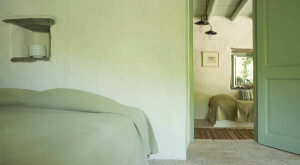 Families are welcome at Ktima Lemonies, and the suite can accommodate a family with up to two children. 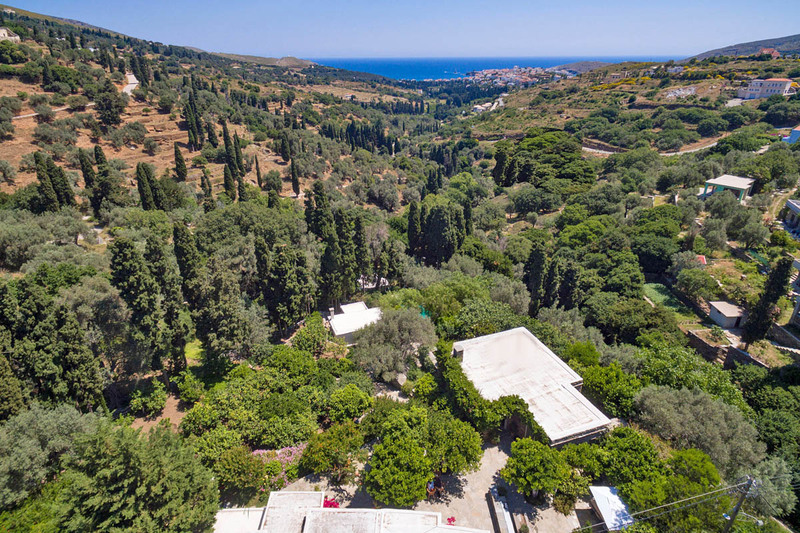 While personally I think Ktima Lemonies is indeed a wonderful place for holidays with children, you should be aware that because of the landscape (there are some steep drops) and of course the swimming pool (not protected), young children should not be left without supervision. Also, it is the kind of place where people go to enjoy the quiet and peaceful atmosphere, and the environment is not suitable for noisy kids. 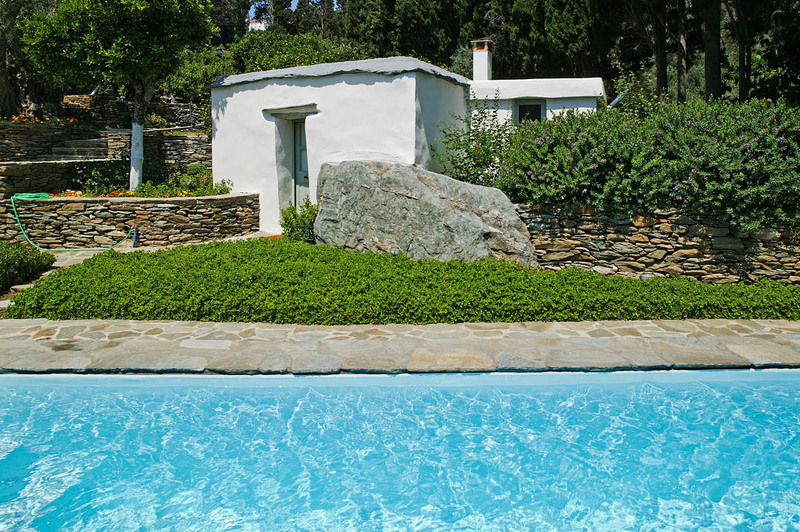 That said, Andros generally is a good island for family holidays in Greece. Take your children on walks and to the many wonderful beaches. There is so much nature to enjoy. Maybe the electronic games can be left at home! Head for the beach, so many to choose from. 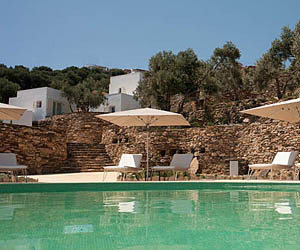 The nearest are right by the Hora of Andros, only a few km from Ktima Lemonies. For the wild and unspoilt beaches on the eastern coast you need to drive further, but believe me, they are worth it. On the west-facing coast, between Batsi and Gavrio, you will find several organised beaches, with possibilities for water sports such stand-up peddling, windsurfing and scuba diving. Bring your hiking boots to Andros. 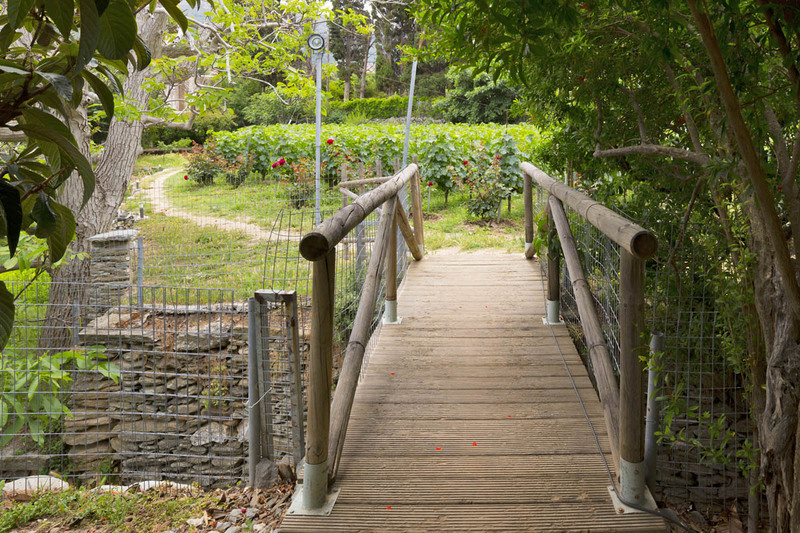 With over 300 km of paths and mule tracks, half of which are clearly signposted, the island is a walkers’ paradise. Choose from over twenty hiking routes, with varying lengths and difficulty levels. 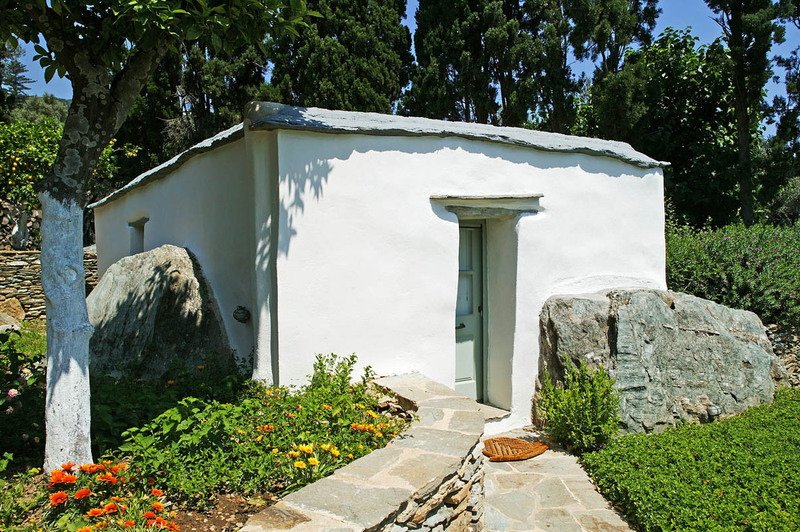 Walk route nr 9 – it starts in Lamyra – and make a stop at the Cyclades Olive Museum in Ano Pitrofos. Maybe walking doesn’t go fast enough for you, and you want to cover more distance? Sign up for a mountain biking tour with Trekking Andros, and be prepared for the challenge of cycling some 25 km on dirt roads in mountainous landscapes. Rent a small motorboat from the town (no licence required), and explore the western coast of Andros – the easiest way to get to some of the most beautiful secluded beaches. 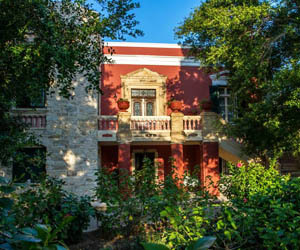 Catch a performance during the all-summer international art festival at the open-air theatre in the town of Andros. Theatre plays are in Greek, but there are concerts too. 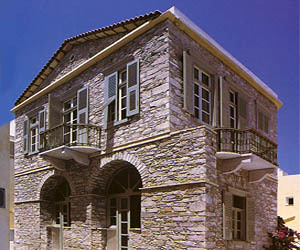 And don’t miss the Goulandris Museum of Contemporary Art, also in the hora. 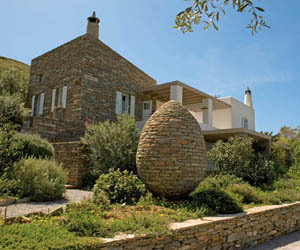 Its permanent collection features perhaps the most impressive collection of modern sculptures in Greece. In the summer there are prestigious art exhibitions that have included oeuvres by Toulouse-Lautrec, Rodin, Claudel, Picasso, Matisse, Miro and Kandinsky. Learn how to cook with indigenous herbs & veggies and to prepare local specialties in Katerina Remoundou’s cooking classes. 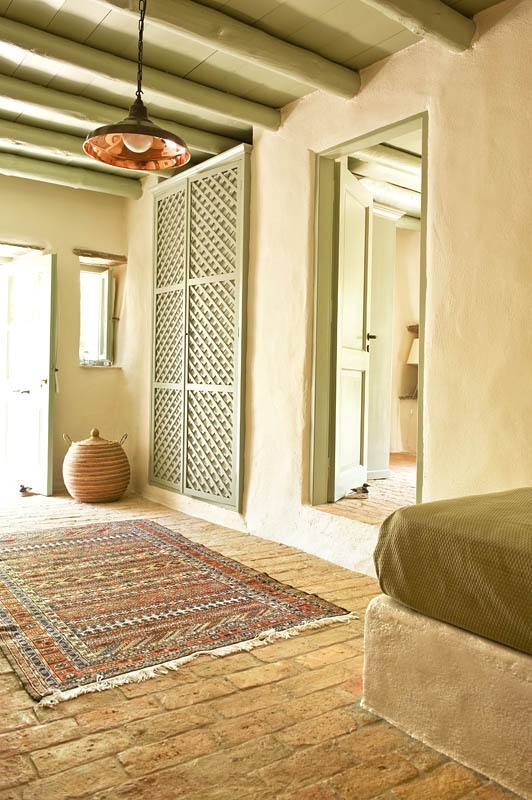 Half-day courses include an introduction to Cycladic cuisine, the preparation of a three-course meal, wine tasting, and of course, enjoying the meal in the end. 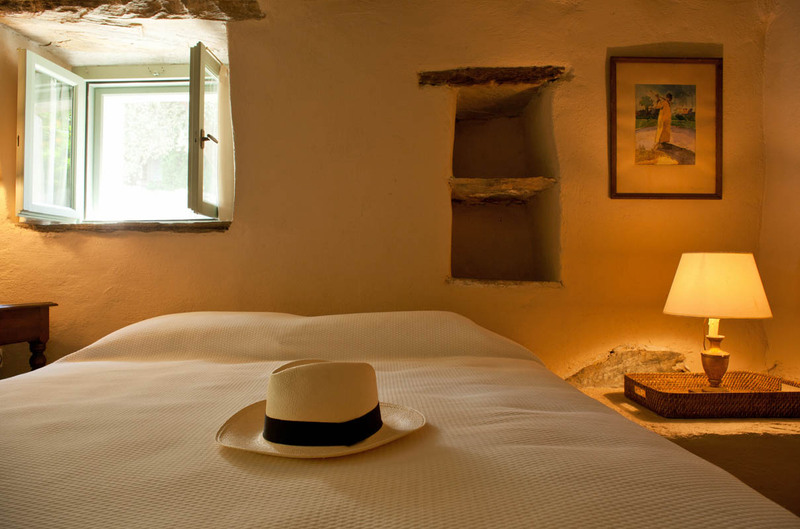 Visit Cave Foros near the village of Aladino. It is not a huge cave, but worth visiting nevertheless. Slip-resistant shoes are recommended; helmets and flashlights are provided at the entrance. 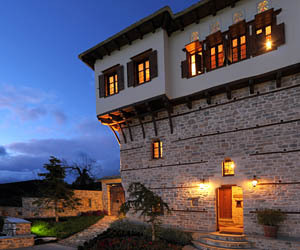 Ktima Lemonies is in Lamyra, a traditional settlement with stately old mansions and charming stone-built farmhouses in an oasis of greenery. 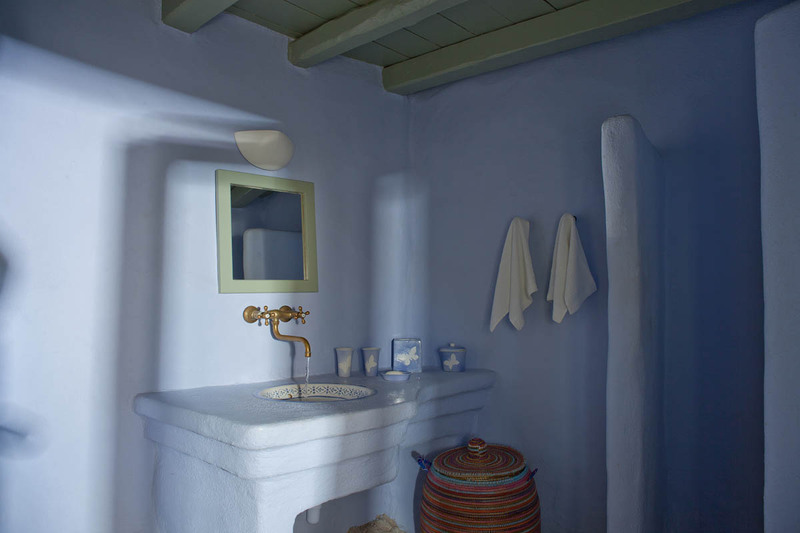 Here water flows (and fruits and vegetables grow) in abundance, and it is one of the greenest spots in the Cyclades. It is really peaceful, and a wonderful area for walks. 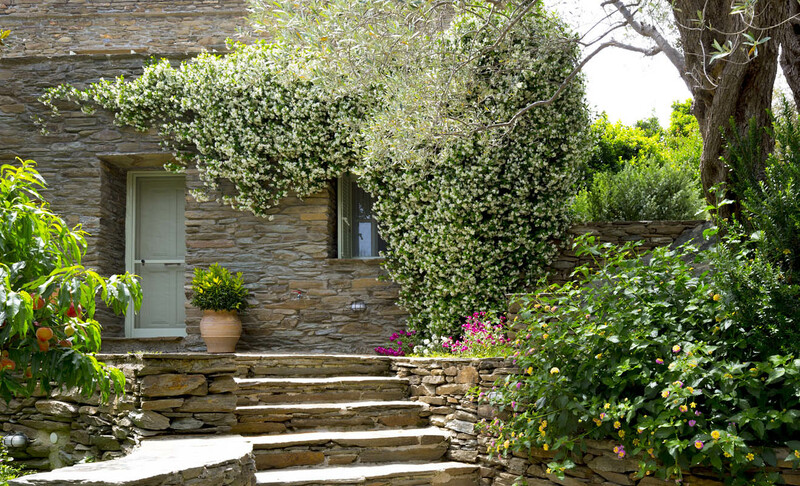 It is 2 km from the hora of Andros and the sea. Andros has no airport, but is reached by several ferries per day. The crossing from the port of Rafina (which is not far from Athens International Airport) takes about two hours. The ferries take cars, so if you arrive by plane from abroad, you may want to rent a car from the airport. Bear in mind that it is better to book ferry tickets in advance (especially if you travel in holiday periods or on weekends). From the port of Andros (Gavrio), drive down to the hora (the main town) of the island. It is 32 km – about 45 minutes’ drive. 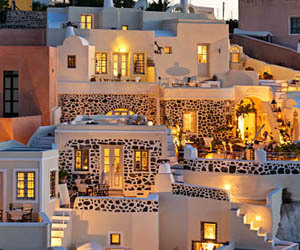 Just before you reach the little town, pass through the village of Messaria. Immediately after you exit the village, take a sharp left turn, follow the zigzag road, and the property is on your left after a steep slope. I knew exactly what I was looking for: peace,comfort good food and kindness and Ktima Lemonies excelled in all of these. 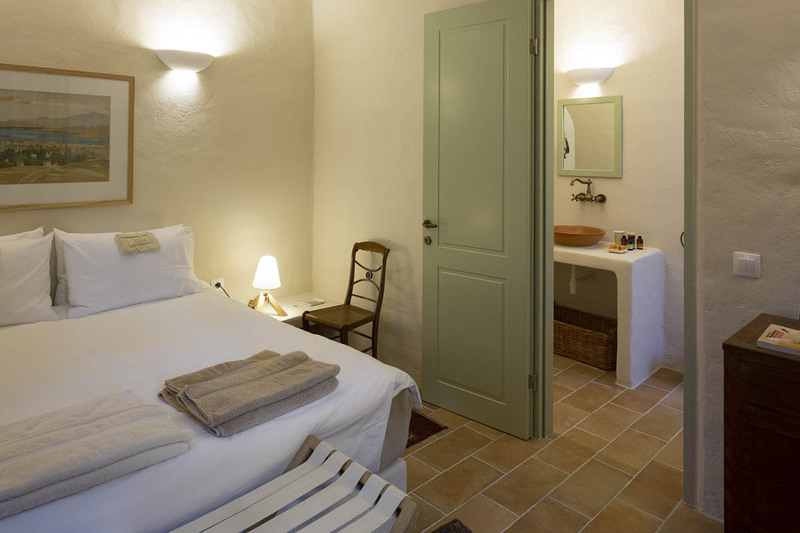 Our (double)room was perfect: furnished in exquisite taste and immaculately clean. Our breakfasts were a festival of colours and tastes. Everything was done by Nelly and her staff to help us enjoy our stay. 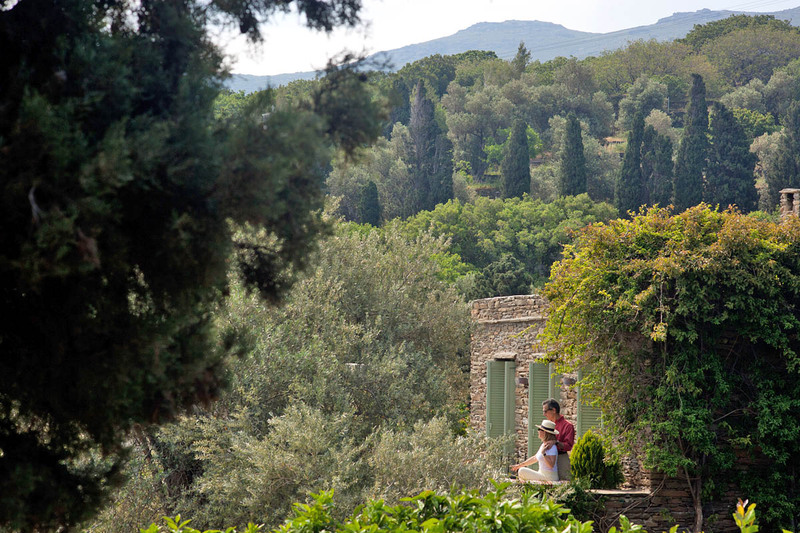 We hope to return soon to this beautiful haven on a leafy hillside. 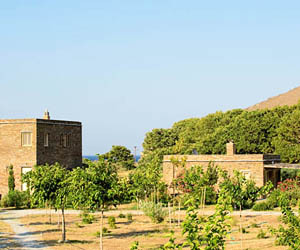 We have just had a most enjoyable 3 nights staying at Ktima Lemonies, recommended by a Greek friend. From start to finish, we were pampered by Mrs Grypari and her team, who were smiling, cheerful and efficient; as a Dutch girl, you might know a bit about cricket, but Nelly’s gardener/handyman was dressed in ‘whites’ that would not have been amiss at Lords! 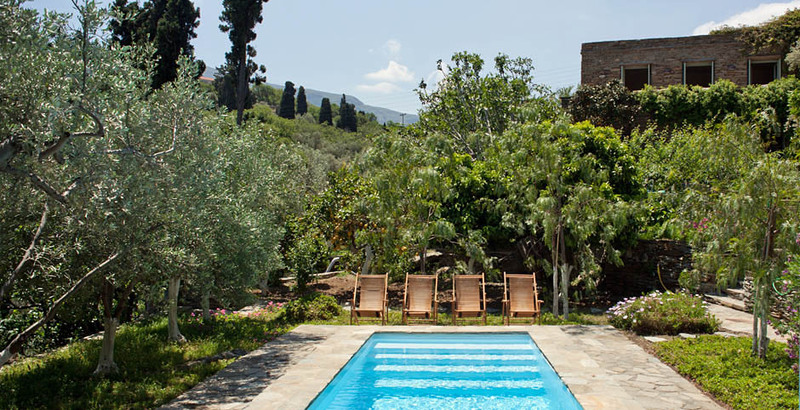 We stayed in ‘the pigsty’ which was immaculate and very comfortable; the pool outside, I reckon, rates better/bigger than the plunge pool you wrote about! The breakfasts were stunning – all home produce, but definitely not for the weak-willed on a diet; I am only sorry we did not have time to ask for a home-cooked dinner. 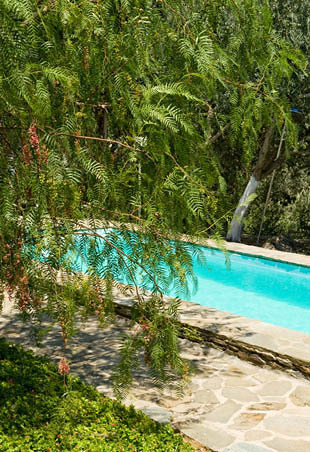 All in all, this oasis was the gem of a find, ten out of ten, and your book in Greece will be used as a map, just as we use the Michelin Guide in France.